Some people love going to the gym and find inspiration sweating out the toxins with a group of like-minded people. Others prefer to workout at home, whether it’s due to time constraints, the high cost of gym memberships, or for other reasons. If you fall into the latter category, there are a few essentials you should have in your home gym: a good weight bench, a set of free weights or kettlebells, a sturdy exercise ball, and something you can use for cardio. Our favorite cardio “somethings” are treadmills, exercise bikes, and elliptical machines. If you have the space and resources, get all three. However, most people with home gyms can’t necessarily fit three large contraptions in their home gym and need to choose just one. We’ve already told you about the best treadmill for home use and the best exercise bike for home use. Now we’ll cover the best elliptical machine for home use. 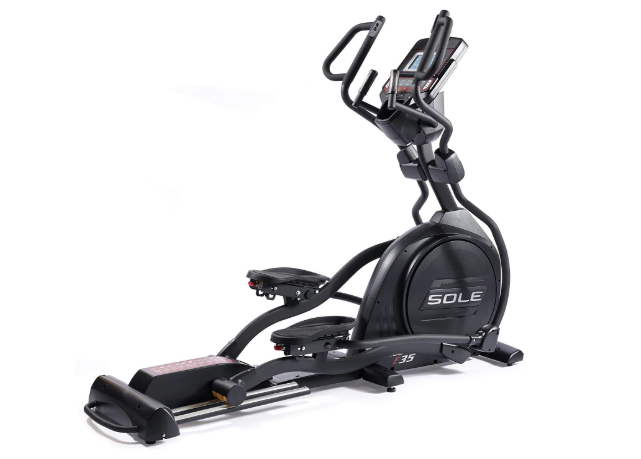 Sole Fitness makes great products and the Sole 35 elliptical machine is hands-down our favorite elliptical machine for your in-home gym. It offers a smooth, quiet ride, has easy to use controls, and features a handheld heart rate monitor or a chest strap if you’d prefer a hands-free option. It can incline up to 30 degrees and offers 16 different resistance levels. Keep in mind this machine is big and expensive… But if you have the space and are willing to invest a decent amount of money in your fitness goals, this machine can’t be beaten. It also offers one of the best warranties we’ve come across: a lifetime warranty on the frame, five-year warranty on electrical and parts, two-year labor warranty, and an optional 5-year fitness plan warranty from Warrantech with free in-home service. Weight limit: Maximum User Weight: 375 lbs. While elliptical machines, in general, aren’t cheap, there are some good lower-priced models out there. The Nautilus E614 is our favorite. In addition to its affordable price, it comes with some of the best features we’ve seen. These include a DualTrack LCD Display monitor which lets you put your book or kindle on the support in front of the large monitor while tracking your progress on a second display. 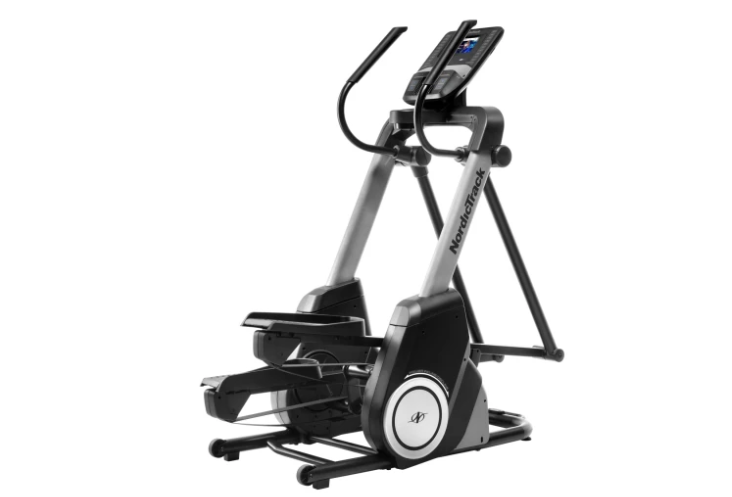 It also offers 22 workout programs, 30 resistance levels, a 3-speed fan, adjustable incline, and so much more. It has a 300 lb weight capacity and a 10-year warranty. Warranty: 10-year warranty on the frame, 2-year warranty on parts, one year warranty on electronics, and 90-day labor warranty. NordicTrack has been around for years and we love its C 12.9 Elliptical Machine. It topped our list because of its great features. It has a 32-pound flywheel for stability, a 20-inch adjustable stride, and 26 different levels of resistance. It even has a 0 to 20 adjustable incline! Plus, it’s interface is super easy to use thanks to one-touch controls and a 7-inch touchscreen. The pedals are adjustable, as are the upper body grips. It comes with a Bluetooth-enabled chest strap that monitors your heart rate. Our favorite feature, however, is the iFit technology, which provides access to personal trainers worldwide. These trainers can not only provide fitness tips, but guidance on nutrition and sleep, as well. iFit can be accessed via the elliptical’s console or downloaded to your mobile device. If your goal with an elliptical machine is to walk long (or short) distances, you don’t need a lot of bells and whistles. That’s why the Schwinn 470 elliptical machine is our favorite for walking. It’s simple, it’s affordable, it has a motorized incline, 29 preset programs, and even syncs with the RUnSocial app to let you connect with other walkers or runners. Sync-ability: Can syncs with seven fitness apps such as Schwinn Trainer, My Fitness Pal, Apple Health and RunSocial. Elliptical machines are similar to treadmills: they’re cardio machines that help you build and tone muscle in order to lose weight. However, while treadmills are high-impact exercise equipment, elliptical machines are low-impact. As your feet stay on the pedals rather than pound the mat, elliptical machines are better for your knees, legs, and feet. If you have past injuries or just prefer low-impact cardio exercises to high-impact, an elliptical may be one of the best cardio exercise equipment for you. 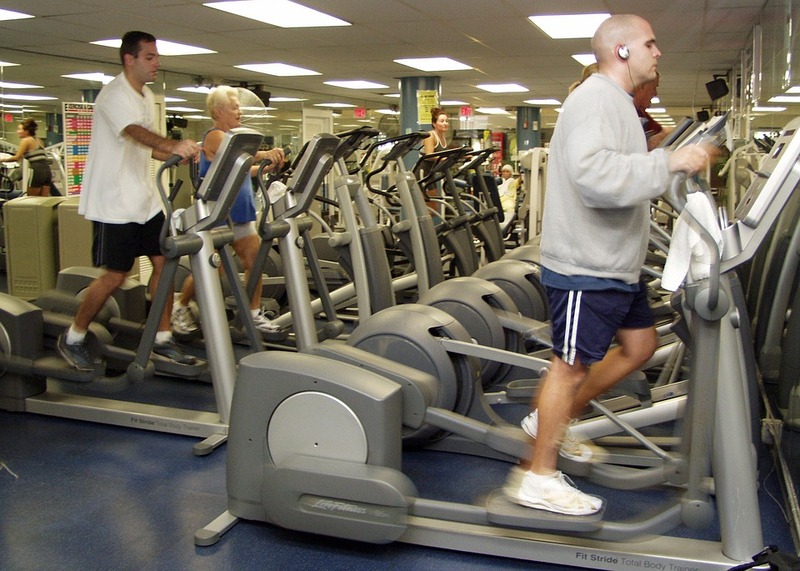 There are three main types of elliptical machines: front drive, center drive, and rear drive. They differ based on the placement of the flywheel: rear drive elliptical machines feature the wheel at the back, front drive have the wheel in front, and center drive elliptical machines feature a flywheel that is centrally located on either side of the pedals. Front drive elliptical machines are the most basic type of elliptical machines and also the cheapest. As such, this is the type of elliptical machine many people tend to select for their home gyms. The flywheel is located in the front, which requires you to lean forward a bit, similar to a stair machine. For some, this can be a drawback, as the glide isn’t as smooth. Front drive elliptical machines also tend to have more moving parts than other types of elliptical machines and as such may require more maintenance. They also tend to be a bit noisier than other types of elliptical machines. 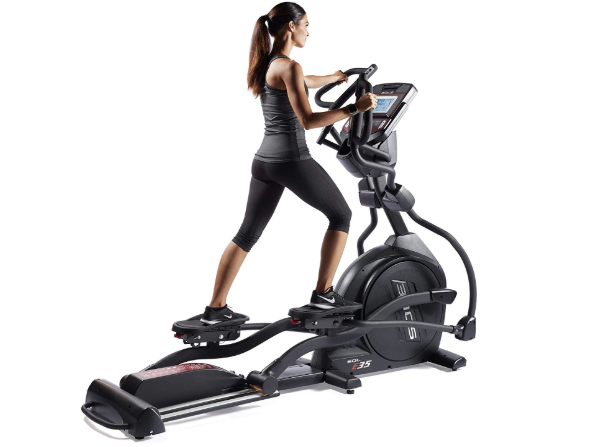 Rear drive elliptical machines feature a flywheel that is located in the back of the elliptical and are most often found in gyms and fitness centers. Rear drive elliptical machines provide a smoother ride than front drive machines: you’re able to stand up straighter than you can on front drive machines, which enables a more natural feeling stride comparable to running or jogging. 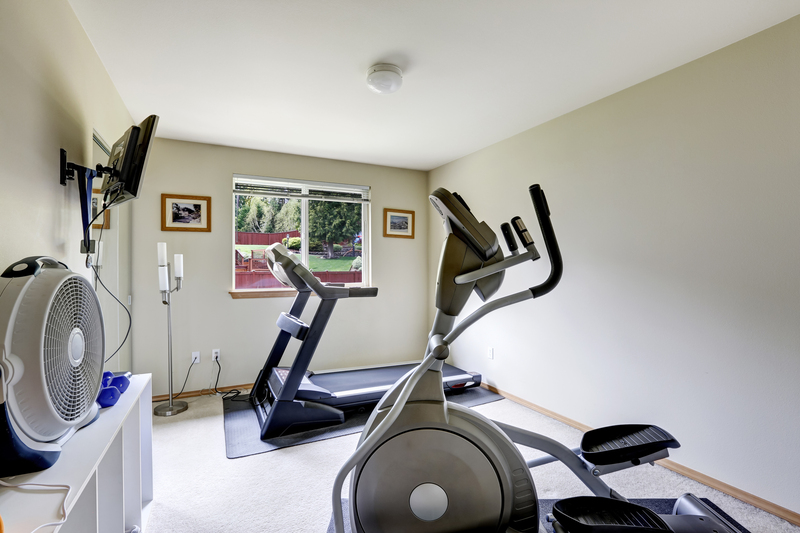 Unfortunately, these machines take up the most space of any elliptical machine, so unless you have a very large home gym, you may not be able to accommodate it. On the bright side, if you do have the space, rear drive elliptical machines have fewer moving parts than front drive so require less maintenance. They also offer a quieter ride. Center drive elliptical machines are the newest model in the world of elliptical machines and the most expensive. The flywheel is centrally located on either side of the pedals and allows you to stand up straighter than front drive machines do. These models usually come with onboard entertainment such as televisions, fitness programs, and more. Unfortunately, they do not have an incline option, so if you want an elliptical machine that can mimic hills (and target different muscle groups), this will not be the best elliptical machine for you. Now that you know the three main types of elliptical machines, we hope you have an idea of which will be the best elliptical machine for your in-home gym and fitness needs. If you have a large in-home gym, you can pretty much get any size elliptical machine you want. And we’re jealous! For most people, however, that’s not the case, and space constraints can dictate what size elliptical machine is the best elliptical machine for your in-home gym. Elliptical machines typically range in length from 50 inches to 84 inches; average ones are about six feet long and two and a half feet wide. Keep in mind they also elevate you more than treadmills or bikes do, do you want to make sure your ceilings are high enough. At their apex, pedals can reach up to 25 inches off the floor. You’ll also need empty space in front of or back of the machine, as well as about 20 inches on either side. It doesn’t matter if you get the best budget elliptical machine or the most expensive: all elliptical machines have varying degrees of resistance. You’ll want to test the resistance settings before you buy to make sure that the lowest setting is easy enough for you and the highest is challenging enough (if it’s too challenging, that’s okay – you can make it a goal to work up to it). Stride range is one of the most important aspects to consider when looking at the best elliptical machine for you. If the stride is too short, your legs can move in too short, which is uncomfortable and will not provide the fitness you seek. Conversely, if the stride is too long, you can wind up overextending your legs and pulling a muscle. In general, one of the best ways to determine the best elliptical machine stride length is by height. Most people are comfortable with a 20-inch stride length. This is the stride found on most ellipticals in private gyms. If you are shorter than five feet three inches, however, you’ll likely feel best on an elliptical machine with a stride length of 16-18 inches that can extend up to 20 inches. 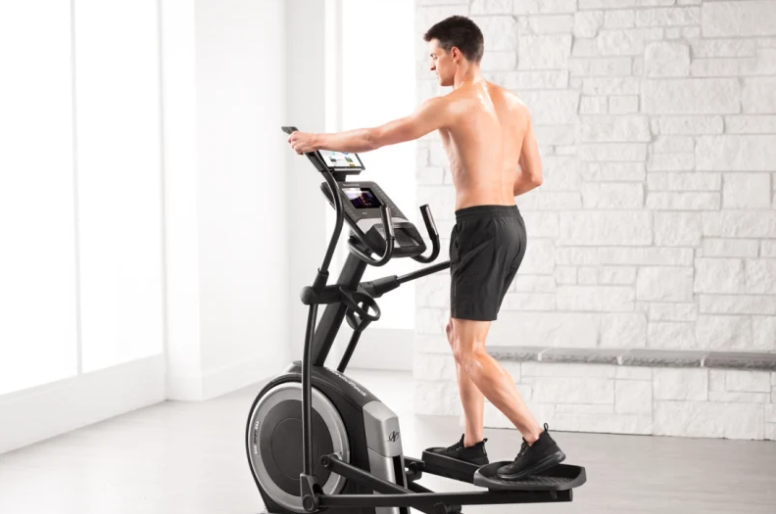 If you are taller than 5 feet seven, you’ll want to start with an elliptical with a 20-inch stride and increase from there until you find your ideal stride length. No matter what kind of elliptical you buy, it’s going to be a decent sized investment. Even the cheapest ones still run in the hundreds of dollars. Thus, you want it to be durable and last. User weight: The more strain put on an elliptical machine, the harder it has to work. Machines with higher maximum weights are typically more durable than those will lower limits. As reference, most home elliptical machines have a weight limit starting at 300 lbs. If you see a machine with a lower weight limit, we wouldn’t recommend it. Material: If you’re looking at an elliptical machine with plastic parts, we suggest you walk away. It’s not going to last very long. Instead, look for an elliptical machine with metal and resin parts, as these materials reduce the risk of breakdowns and make the machines more stable. Drive type: We’ve already taught you about rear drive, front drive, and center drive. In general, rear drive elliptical machines are the most durable and have fewer maintenance needs. Some elliptical machines require a bit more care and maintenance than others but in general, they are very low maintenance machines. The most important thing you can do to care for your elliptical machine is to keep it clean. Wipe it down after each use, ensuring that any sweat you may have dripped is cleaned from the console and grips. We recommend wiping with a damp cloth or Lysol wipe and then drying it. Never use spray cleaners, as these can damage the console. You’ll also want to put a rubber mat beneath the machine to protect your floors as well as prevent dust and debris from getting inside the flywheel. From time to time, make sure to check that the nuts and bolts are still tight, as they may have loosened with each workout (especially if you are working out intensely). 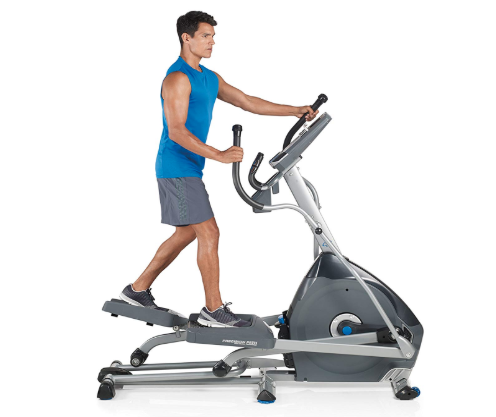 Some elliptical machines offer an adjustable incline while others don’t. Adjustable inclines allow you to tone different muscles and burn more calories. 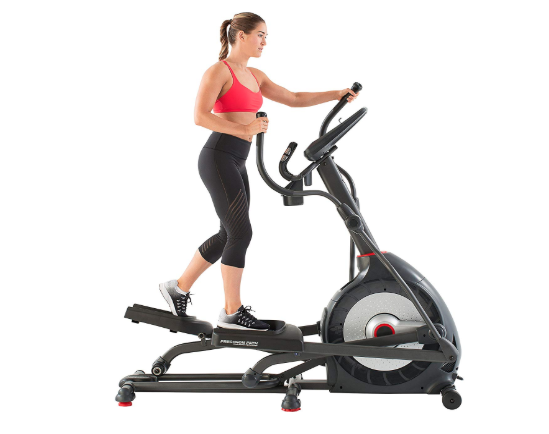 Typically, more expensive elliptical machines have adjustable inclines with the cheaper models do not, but incline is by no means a factor in a “good” or “bad” elliptical machine. It’s just a personal preference. If you think you’d like to simulate climbing hills on your machine, then consider looking at ellipticals with an adjustable incline. If not, don’t. It all comes down to personal preference. If you want to track your workout (and who doesn’t?) you’ll need an elliptical machine with an easy to read display. Pretty much all elliptical machines can show you your time, speed, distance, calories burned, and even pulse. Some can even show you how many times you’ve run a ¼-mile track and how many watts you’ve generated. 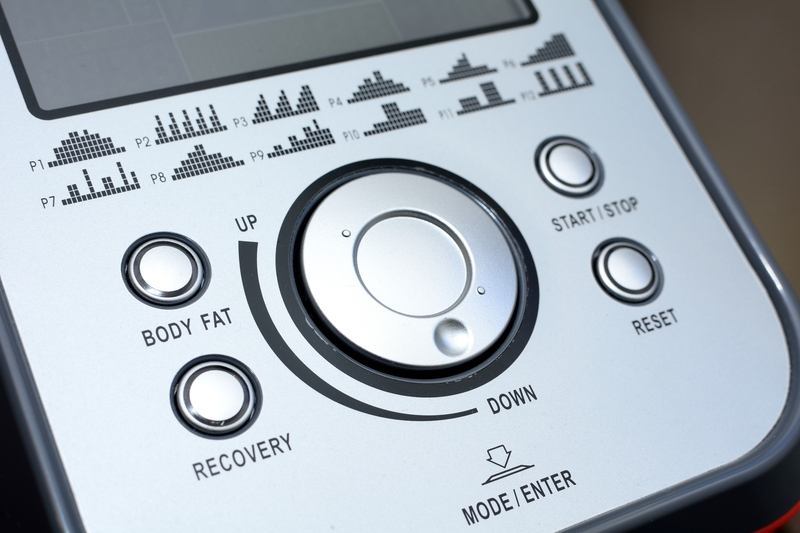 When looking at ellipticals, make sure you can easily see the display and easily change settings. Our favorite displays are one-touch touchscreen displays: with just one tap, you can rotate between different screens. If you’re looking for a bit more, consider an elliptical machine with built-in wireless connectivity or Bluetooth settings. This way you can synch your workout to your smartphone or smartwatch, stream your favorite videos (whether workout videos or just your favorite TV show), and more. Some people like to workout at their own pace while others prefer a bit of guidance. Which type are you? If you fall into the latter category, you’ll likely prefer an elliptical with as many pre-programmed workouts as possible. These can include cardiovascular routines, interval training, or weight loss routines. You can also find ellipticals with user profiles: if more than one person in your household will be using the elliptical machine, you can set up multiple profiles and then create customized workouts for each user. Electronic monitors: The handles of most elliptical machines have sensors that can measure your heart rate,the intensity of workout, calories, and miles covered. One or two-way motion: Pretty much all ellipticals let you pedal forward, and some allow you to pedal backward as well in order to work different muscles. This is also a safety feature should anything get caught in the flywheel or pedals. Handles: All elliptical machines come with handles, whether movable or stationary. These handles provide additional stability (and some can also give you an arm workout). 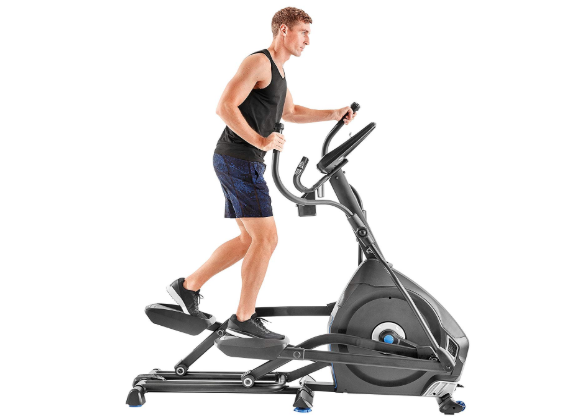 Adjustable stride length: Most elliptical machines have an adjustable stride length which is important in order to avoid overextending your muscles (or not extending them enough). Elliptical machines are expensive (yes, even the cheapest are several hundred dollars) so you want to make sure it will last. Most in-home elliptical machines come with a limited warranty that includes standard parts and electronics. Some have lifetime warranties on the frame, while others have 10-year warranties. Warranties on the electrical parts tend to be less. We even came across some elliptical machines that had only 90-day warranties which made us uncomfortable… If you’re purchasing from a reputable company, shouldn’t they guarantee their elliptical to last for more than three months?